Jay Critchley, Artist at abandoned nuclear power plant, Tennessee, 1988. Jay Critchley, Bible reading by artist, abandoned nuclear power plant cooling tower, Tennessee Valley Authority, 1988. August 4th-September 10th, 2011. Summer hours: Tuesday - Friday, 11 - 6 pm. Freight + Volume is very proud to announce the New York debut of two remarkably talented installation artists. 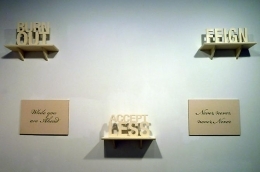 As both politically- and ecologically-motivated voices, this pairing will transport the viewer through an unusually provocative and timely dialogue amongst the F+V walls. O Swallower of Shades…, I have not slain people…, O Breaker of Bones…I have not stolen food…, O He-who-is-Blood who came forth from the place of slaughter, I have not done grain-profiteering. 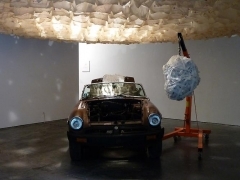 In the main gallery, the artist’s performance installation will eviscerate the “organs” of a classic MG sports car, ritually wrap each engine part with recycled plastic shopping bags, display them, and finally return them to the corpus vehicle and mummify the car. 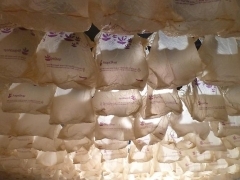 Above, a lowered, circular ceiling fashioned from recycled plastic shopping bags will hover over the remains. In the video room, Critchley presents NRC – An Atomic Journey. In 1988 Critchley made a pilgrimage to abandoned, un-built nuclear power sites and facilities across the Mid-West/USA as president of the Nuclear Recycling Consultants (NRC). This video installation documents official visits and ritualized actions that explore our relationship to the atom and our quest for dominance of nature and the future itself. NRC -An Atomic Journey visits sites in Tennessee, Mississippi, Ohio and Indiana, exploring links on a proposed Nuclear Heritage Trail. The video installation will be projected above a trough of consumables immersed in motor oil, with the reflected light dancing upon its petro-surface. 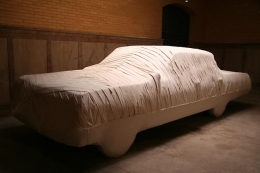 Critchley’s environmental work dates back to the early 1980s with his sand car series in a waterfront parking lot in Provincetown. Founder of the patriotic, controversial Old Glory Condom Corporation and several corporate personas, his videos and conceptual proposals and projects have won numerous awards, including ones from HBO and the Boston Society of Architects, and he has had residencies at Harvestworks, NYC, Harvard University, AS220 in RI and Milepost 5 in Portland, Oregon. His work has been presented world wide, and recently in Argentina and Colombia. Chad Person explores the concepts of heroism, manifest destiny, and apathy in a new show titled A Hero Never Fails. Using his signature repertoire techniques of inflatable sculpture, currency collage, and video Person’s objects ask the viewer: what is heroism and why do we care? 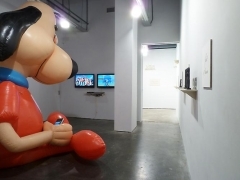 The centerpiece of the exhibit is Hero, a defeated caricature of the 50’s cartoon character Underdog. The goofball "hero who never fails” has resigned to abject apathy. 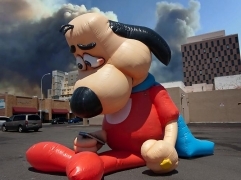 Hero is rendered as a gigantic inflatable (a la used car dealership gorilla). Strung out on the “super vitamin pills” that provide his super powers, he sits slumped forward, meditating on his iPhone. 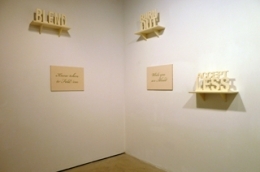 Person’s work has been exhibited internationally, with his most recent solo show at Mark Moore Gallery in Los Angeles. His provocative and controversial RECESS project recently led AOL.com to label Person "the most paranoid man in America." And in 2010, one of his sculptures was seized from Mark Moore Gallery by the Bureau of Alcohol, Tobacco, Firearms and Explosives pending allegations that it was an illegally manufactured and trafficked firearm. Please join us for a lively artists’ reception Thursday, August 4th from 6-8pm. On opening night, Jay Critchley will conduct a ceremony at the body of the MG, O Breaker of Bones, at 8:00 pm. 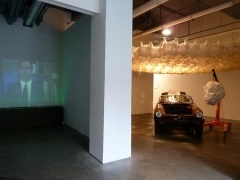 During gallery hours on Tuesday and Wednesday, August 16th and 17th, Critchley will work in the space, returning the wrapped engine viscera into the cavity of the car and then ceremoniously mummifying the MG with recycled shopping bags. The public is welcome. For further information, please contact Nick Lawrence or Kevin Kay @ 212-691-7700, or info@freightandvolume.com.